This book has brought 24 groups of experts and active researchers around the world together in image processing and analysis, video processing and analysis, and communications related processing, to present their newest research results, exchange latest experiences and insights, and explore future directions in these important and rapidly evolving areas. It aims at increasing the synergy between academic and industry professionals working in the related field. It focuses on the state-of-the-art research in various essential areas related to emerging technologies, standards and applications on analysis, processing, computing, and communication of multimedia information. 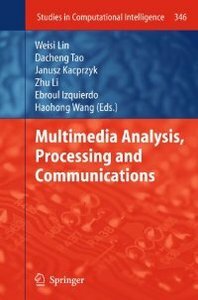 The target audience of this book is researchers and engineers as well as graduate students working in various disciplines linked to multimedia analysis, processing and communications, e.g., computer vision, pattern recognition, information technology, image processing, and artificial intelligence. The book is also meant to a broader audience including practicing professionals working in image/video applications such as image processing, video surveillance, multimedia indexing and retrieval, and so on. We hope that the researchers, engineers, students and other professionals who read this book would find it informative, useful and inspirational toward their own work in one way or another.